Microsoft Excel is one of the most commonly used spreadsheet programs, and it can be used for a huge number of different applications. One of the many uses that a spreadsheet can be used for is to display one’s income. This is particularly useful for those who need it for tax purposes. 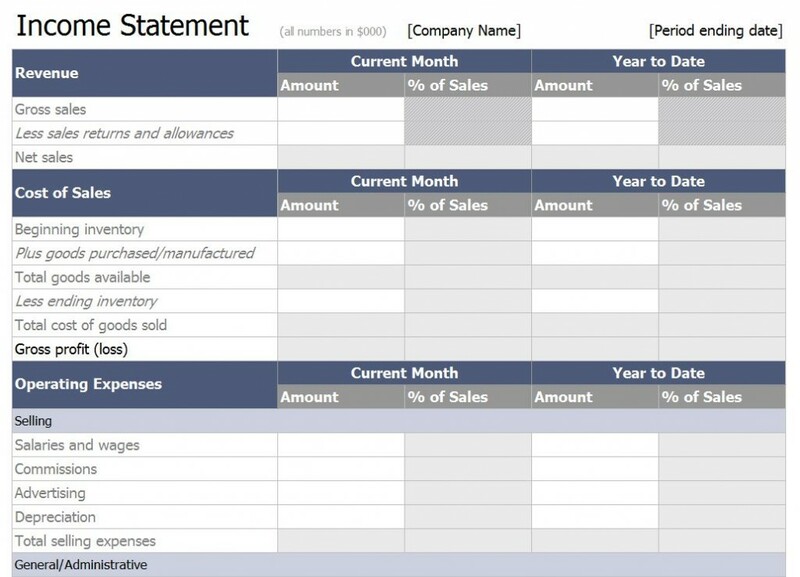 However, for those who want to make the computer do the heavy lifting for them, it’s a good idea to get an Excel income statement template. What is an Excel Income Statement Template? As the name implies, an Excel income statement template is a spreadsheet template that’s already been partially laid out for the person filling in his or her data. All someone has to do once he or she gets the template onto his or her computer is to open it up, and to fill in the appropriate information in the proper categories. It’s actually fairly simple and straightforward. As long as one remembers to click “Save As” and re-name the file something like “income statement 2012” rather than just clicking “Save” and over-writing the original template with the one that’s had all of its information completely filled in already. Get the Excel Income Statement Template for Free! While some places that offer an Excel income statement template might charge for the file, we offer one of these fine templates at no cost to our users. All one has to do is click the link, and save the file to his or her computer. Once the file is saved all someone has to do is open it up and start working. It’s really that simple, and there’s no hidden fees or costs associated with it. The Excel income statement template is free to anyone who wants it, and it can be customized to fit every individual’s needs so that they have solid records for displaying their income. What’s more, this file isn’t a one-time-only sort of deal. Anyone who needs this template to help show their income can download one, and individuals can download a copy as often as they need one. Whether the original gets lost or deleted, corrupted or just overwritten, all someone has to do is come back to the site and download a new one, with no questions asked. It’s always free, and it’s always easy to use, so why wait until it’s too late? Start tracking your finances with a simple Excel spreadsheet template today!